The Perioperative or 'OR' Nurse is an individual who works with the patient being prepped for surgery, their family, and as a member of the interdisciplinary care team. The OR nurse helps to evaluate the patient, then plan and implement various steps to, during, and beyond surgery. Nurses who enjoy direct patient care and a good deal of change may enjoy spending time in the OR. Consistently looking for job postings in the perioperative role throughout local hospitals or medical networks is the most effective way for nurses to find a position that they're interested in applying for. Newly graduated and licensed nurses may have to complete an internship that includes both a didactic and practical component before being deemed ready to fulfill the role independently. Experienced nurses who approach the role from a different specialty and background will have a similar lengthy orientation and learning curve to the OR role but it may be shorter, depending on their prior knowledge and experience. What Are the Education Requirements for an Operating Room Nurse? Perioperative nurse positions require that the applicant have an RN license in good standing. This can be achieved, at minimum, by completing a 2-year Associate's Degree in Nursing (ADN) program. A BSN is not required for all operating room nurse positions although it is preferred by employers. Some employers may require than an applicant agrees to complete his or her bachelor's degree within a certain timeframe after hire. Perioperative nursing positions are typically open to new graduate RNs who have successfully completed an internship program, as well as to experienced nurses with at least one year of bedside experience. Where Do Operating Room Nurses Work? The perioperative nurse typically works in a hospital, outpatient surgical clinic or physician's office. The Pre-Op nurse performs the necessary duties to prepare the patient for a surgical procedure. These may include collecting vital signs and a health history, starting intravenous catheters (IVs), performing a detailed head-to-toe assessment to ensure the patient's condition is stable for surgery, verifying that the appropriate paperwork is complete, and providing emotional support and teaching to the patient and family. The Intra-Op nurse works inside the operating room and different roles are in place for this role, as well. The nurse may be assisting the surgeon working as a Circulator to ensure a sterile and controlled environment. This nurse also ensures all necessary personnel, equipment, and supplies are readily available, as well as completing necessary paperwork and being sure anyone who enters the OR is a necessary and documented addition to the environment. The Post-Op, or PACU nurse works in the recovery room and receives the patient from the operating room immediately after the surgical procedure. The patient will be either just waking up from anesthesia or is now awake but very sleepy still. The Post-Op nurse monitors for complications during this process. Usually, a patient remains in the recovery room for 1-3 hours depending on the patient's condition and the standards of the hospital. The PACU nurse then either discharges the patient home or transfers them back to the floor of the hospital or ICU where safe care will be continued. What Are the Roles & Duties of an OR Nurse? 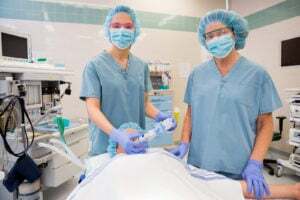 Even with the emphasis on preventative care, perioperative nursing roles are expected to increase by about 19% into the next decade, according to the Bureau of Labor Statistics. While job growth rates vary throughout the country, locating close to busy hospitals and teaching facilities might mean higher rates of perioperative opportunities and room for advancement as opposed to less urban regions. The median salary for an operating room nurse is $66,713 with a range of $49,419 - $93,569. Location, experience, education, and certifications affect salary.